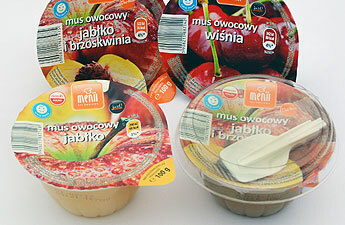 RPC Bebo Polska has developed a new multilayer polypropylene pot, which will provide new shelf impact and food protection for Menii’s Fruit Mousses range. Poland-based Menii is a family firm which processes fresh fruit into mousses with no preservatives, additives or food colouring. The mousses are available in several flavours such as strawberry, peach, pear, apple and cherry. They are also available in mixed fruit varieties and with added chocolate. Menii was looking for a functional pack that would protect and maintain the contents freshness in order to make sure product quality and maximize brand awareness as well as its image. RPC Bebo Polska’s Ro 84 tub features a barrier layer of EVOH to avoid oxygen ingress. It offers an extended shelf-life. The company said the mousse is pasteurized in the container and then sealed with a closure showing the variety of fresh fruit in the pack to create better shelf stand out in retail outlets. Maximum consumer convenience will also be ensured with the peelable closure and light easy-handling tub. RPC Bebo, part of the RPC Group, manufactures thermoformed packaging, offering solutions for a range of markets including margarines, spreads, fresh, frozen and ambient shelf stable foods. It also offers solutions for seafood, meat & poultry, dairy products, baby food, fruit, ice cream, coffee capsules, and vending cups. Earlier this month, RPC Bebo Bouxwiller developed new thermoformed polypropylene tubs and lids for Franche Comté’s Cancoillotte speciality spreadable cheese. Image: Menii’s Fruit Mousses get a fresh look. Photo: courtesy of RPC Bebo.